The US economy is at “full employment,” says the official 3.9% unemployment rate. The problem is that fully employed people haven’t seen enough wage growth. It’s a puzzle. Wages used to rise faster when unemployment was this low. 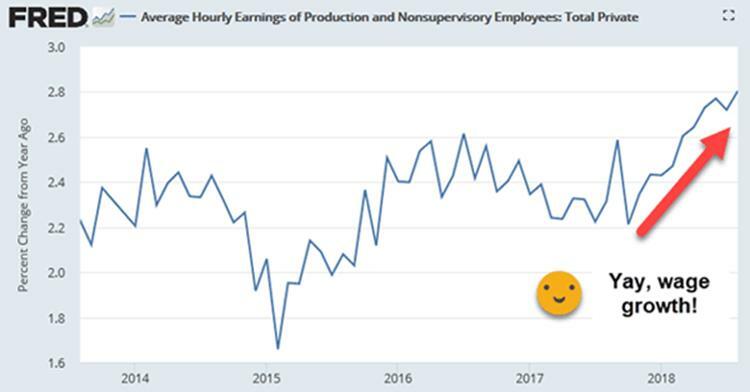 That’s why there was much celebration when the August jobs report showed a 2.8% annual increase in average hourly earnings for “Production and Nonsupervisory Employees,” i.e., regular workers. The media reported it was the fastest wage growth since 2009. That was correct in a narrow, technical sense. But not in real life. Aside from employment data, the Bureau of Labor Statistics also compiles the Consumer Price Index (CPI), our primary inflation gauge. In the same period in which average hourly earnings rose 2.8%, the CPI rose 2.7%. That’s how much the cost of living went up, on average. So, a 2.8% wage gain is essentially no gain at all. Inflation-adjusted wages are flat since last year. It is certainly not the fastest wage growth since 2009, or even close. But that’s not what you read in the news. They showed you charts like this one, which doesn’t adjust for inflation. 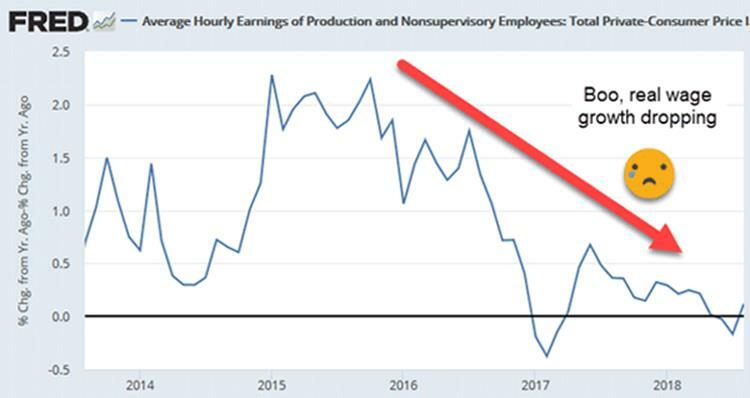 In this chart, wage growth started a nice rally in mid-2017. And apparently, it is set to go higher still. But again, that doesn’t consider inflation. Here is the very same data series for the same time period, but subtracting CPI-U inflation. We see that real wage growth peaked in 2015. Since then, it’s been trending down, except for a brief pop in 2017. And it’s been about zero in recent months. Economists and journalists know about inflation. They often report Gross Domestic Product growth in real terms, for instance. But not wage growth. For that, they assume inflation doesn’t matter. But it matters a lot. Workers whose earnings don’t keep up with inflation find themselves falling behind. Eventually, they notice the problem and look for someone to blame. Hence, our current social and political discord. One more chart. This is average hourly earnings minus CPI-U—same as the sad-face chart above—but this time going back to 1965. 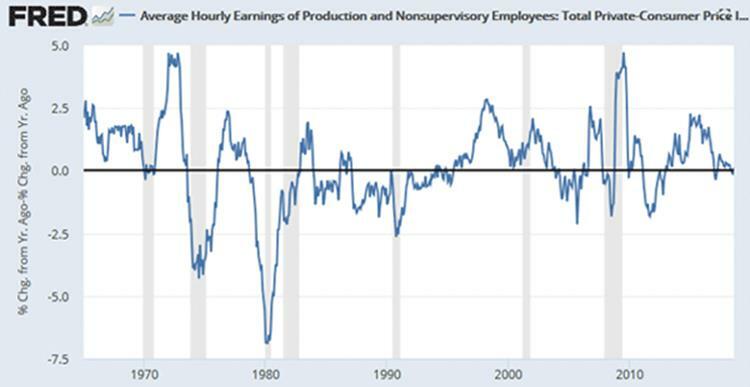 When the blue line is below zero—as it was for long periods—real wages were actually dropping instead of growing. On the positive side, there were a couple of times when real annual wage growth approached 5%. But only a couple, and they didn’t last long. Notice that big spike down in 1980, by the way. That was the recession year when angry voters ushered out Jimmy Carter. Thankfully, we are nowhere near that point now. But neither are we in the best of times. Real wages are flat and trending the wrong way. Yet politicians from the president on down—and experts who should know better—tells workers to celebrate their good fortune. What’s really happened is a redefinition of “good fortune.” Simply having a steady paycheck now means you should count yourself lucky. Economic theory says labor scarcity should force employers to raise wages. That’s indeed happening in certain segments. But it misses a crucial point. Labor isn’t scarce in the growing number of occupations that can be automated. Supply is abundant if you include the machines. I think this helps explain the wage puzzle. Low-wage workers don’t ask for more because they are (correctly) afraid of being replaced. And employers have little incentive to raise wages for those workers. This probably won’t end well. As automation technology improves, millions of people will get steadily poorer and unhappier, and millions more will join them. If we’re lucky, the mass un- and underemployed will peacefully line up to force changes like they did in 1980.